When tragedy strikes or time takes its natural toll on life and you face the death of two or more loved ones in your life, the loss can be devastating. It is hard enough to say goodbye to one dear person in your life. But when you must say goodbye to two, the grieving can be twice as painful. At Memorials.com, we understand your loss. Nothing can ever bring your loved ones back into your life. 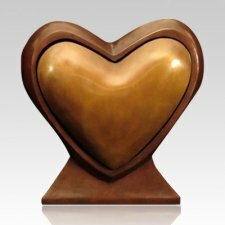 But there is a way to keep the unity of your loved ones alive with our cremation urns for couples. 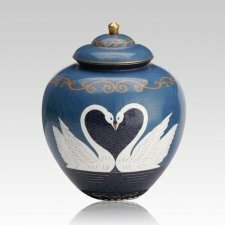 Our cremation urns for two can forever memorialize the bond of love between husband and wife, mother and child, father and son or another couple caught up together in death. 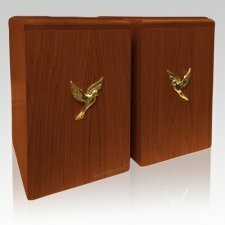 As you encase the ashes of your loved one with one of our double cremation urns, the legacy of the beloved couple can continue to speak to future generations. 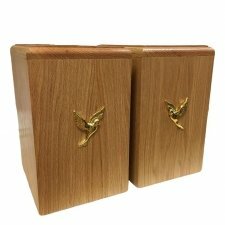 Whether you wish to mingle their ashes into one compartment to accentuate the bond of unity or store their ashes separately to memorialize their individuality, we have beautiful companion urns for two adults that will gracefully hold their remains. 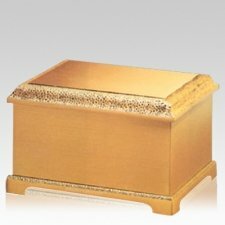 Our large urns for the ashes of your beloved couple can hold the remains of two or more adults. 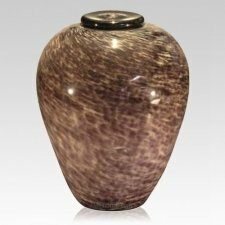 Our stunning collection of large and extra large urns provides a plethora of options and styles to choose from. 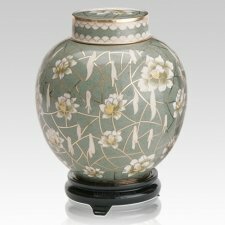 We offer specialty urns, traditional urns, artistic urns and more in a variety of materials. 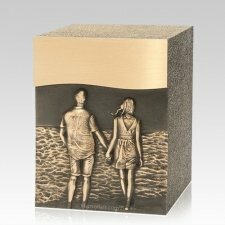 Below we highlight some of our most sought after and stunning cremation urns for couples. 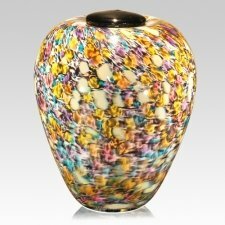 You are sure to find one that will beautifully display the memory of your special people. 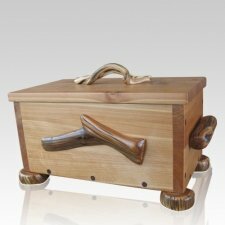 Wood is a lovely material for double cremation urns. 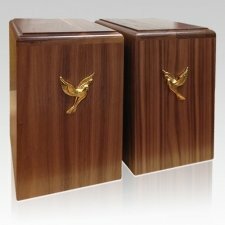 We have a comprehensive selection of wood urns for two in cherry, maple, mahogany, walnut, oak and more. Here are a few worth note: Laser Carved Chests: Our laser-carved wood companion chests allow you to keep the remains of your beloved couple in a natural wood material with a laser-carved picture that represents an activity or idea they loved like spending time at the lake, sailing, fishing, collecting trains or enjoying nature. There are many beautiful laser-carved scenes available to choose from. 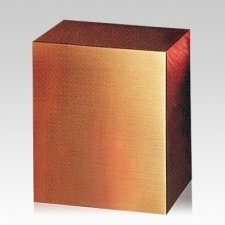 Contempo: Our Contempto companion wood urn is made from hardwood with a cherry finish. 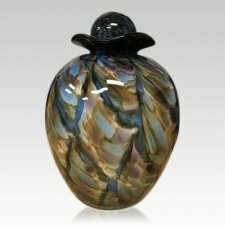 It is an heirloom quality urn that can be engraved with the names of the beloved couple. 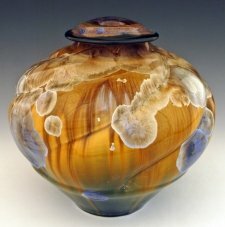 Handcrafted: Our handcrafted wood urns are masterfully lathed and hollowed by talented woodworkers. 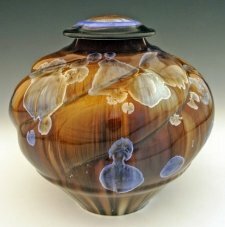 We also offer beautiful companion wood urns that are pieced together to form intricate designs. These are one-of-a-kind pieces that will be cherished for generations. 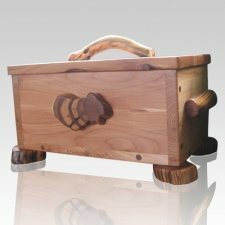 Laser Carved Chests: Our laser-carved wood companion chests allow you to keep the remains of your beloved couple in a natural wood material with a laser-carved picture that represents an activity or idea they loved like spending time at the lake, sailing, fishing, collecting trains or enjoying nature. There are many beautiful laser-carved scenes available to choose from. 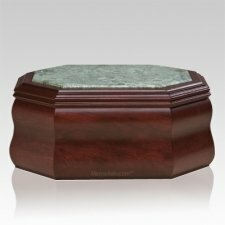 Our Contempto companion wood urn is made from hardwood with a cherry finish. 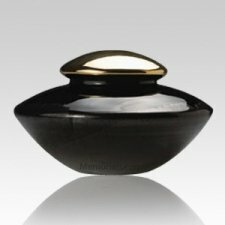 It is an heirloom quality urn that can be engraved with the names of the beloved couple. 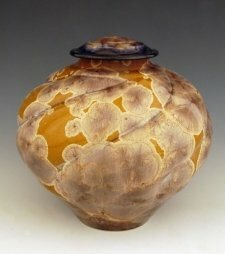 Our handcrafted wood urns are masterfully lathed and hollowed by talented woodworkers. 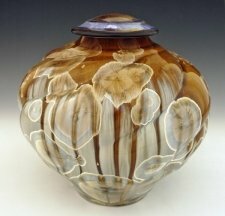 We also offer beautiful companion wood urns that are pieced together to form intricate designs. These are one-of-a-kind pieces that will be cherished for generations. We have a lovely selection of cast bronze, solid brass and other metal urns for two. There are too many lovely metal urns to name each. 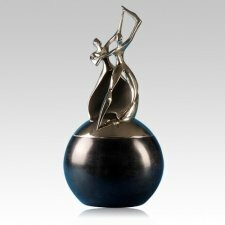 Here are a few of note: Dancing: Our Dance of Life and Heaven Is Waiting cremation urns for two are made of solid brass. They display a dancing couple atop an orb-shaped container. 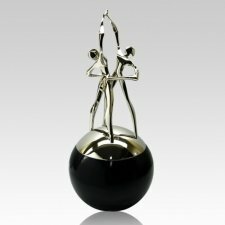 This artistically crafted urn is a stunning and elegant way to commemorate your couple's last dance to eternity. 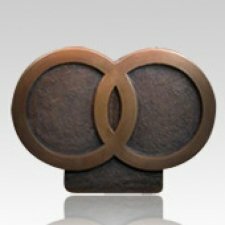 Cast Bronze: Our cast bronze companion ash urns will delight you. 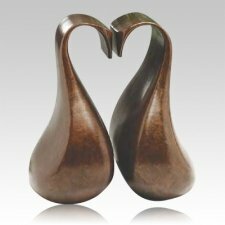 Our Loving Swans, also called the Romance Urn, is composed of two swan-inspired vessels that face each other in eternal love. 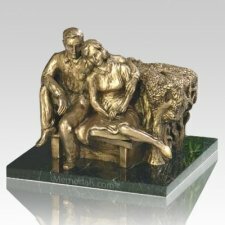 We also offer a Seated Couple urn, Fidelity urn, By the Beach urn, Wedding Bands urn and other cast bronze urns for companions. 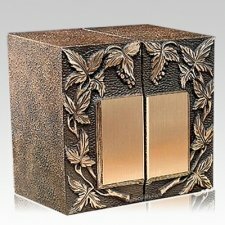 Book of Leaves: Our Book of Leaves double urn has a solid bronze face on a zinc frame. It consists of two books, each holding the ashes of one person. Put them side-by-side, or use them as bookends with mementos in between. 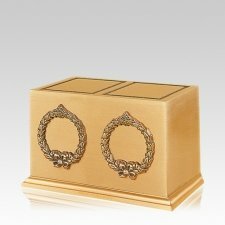 Our Dance of Life and Heaven Is Waiting cremation urns for two are made of solid brass. They display a dancing couple atop an orb-shaped container. 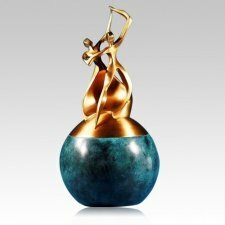 This artistically crafted urn is a stunning and elegant way to commemorate your couple's last dance to eternity. 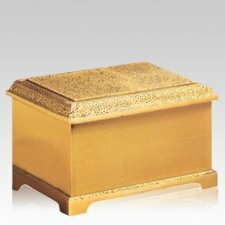 Our cast bronze companion ash urns will delight you. Our Loving Swans, also called the Romance Urn, is composed of two swan-inspired vessels that face each other in eternal love. 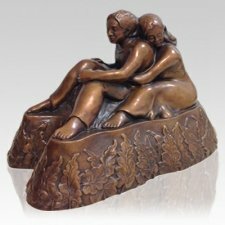 We also offer a Seated Couple urn, Fidelity urn, By the Beach urn, Wedding Bands urn and other cast bronze urns for companions. 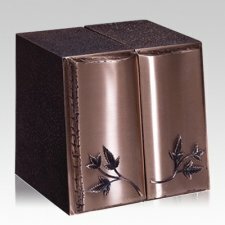 Our Book of Leaves double urn has a solid bronze face on a zinc frame. It consists of two books, each holding the ashes of one person. Put them side-by-side, or use them as bookends with mementos in between. 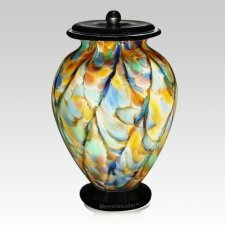 Our ceramic urns come in many stunning and colorful options. Here are a few worth noting: Dolphin: Handmade from porcelain, this vase-shaped ceramic urn has two hand-drawn dolphins on the front. 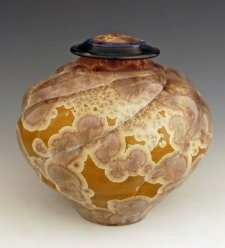 Walking Together: Layers of glazed trees make this unique ceramic companion urn special. 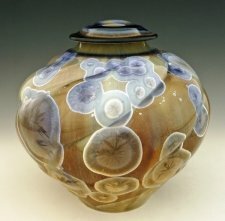 The lid is hand carved from walnut. 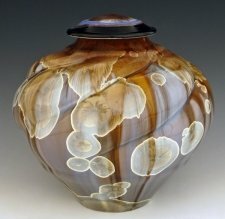 Sunset in Taiwan: This companion ash urn, which is inspired by an evening in Taiwan, will dazzle and delight generations as they ask about the feather and horsehair markings. 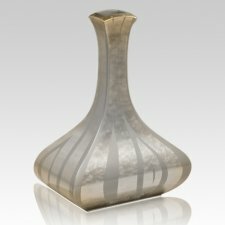 Handmade from porcelain, this vase-shaped ceramic urn has two hand-drawn dolphins on the front. 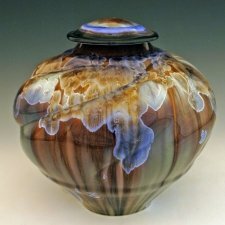 Layers of glazed trees make this unique ceramic companion urn special. 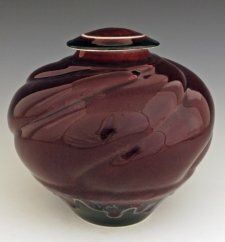 The lid is hand carved from walnut. 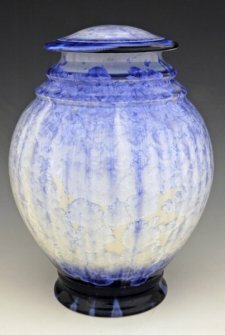 This companion ash urn, which is inspired by an evening in Taiwan, will dazzle and delight generations as they ask about the feather and horsehair markings. Stone is a beautiful and enduring material that will last for many future generations. 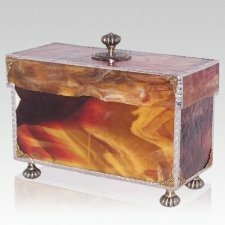 We have some stunning stone pieces available: Husband and Wife: Our Husband and Wife companion urn has two compartments and is crafted from natural quarried marble. Choose from white, green or brown hues. 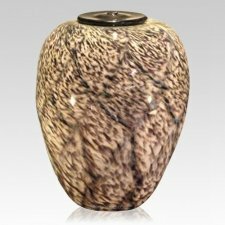 African Alabaster: This elegant sage alabaster urn is hand-lathed in a process that a can take 25-40 hours from start to finish. 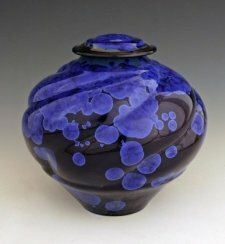 This is an heirloom piece. 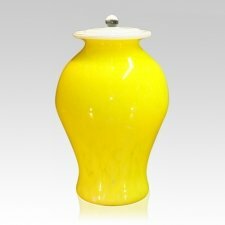 Italian Alabaster: Our Italian Alabaster Family urn is beautifully lathed from natural stone. It is large enough to hold the remains of three to four people. 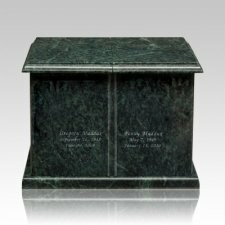 Our Husband and Wife companion urn has two compartments and is crafted from natural quarried marble. Choose from white, green or brown hues. 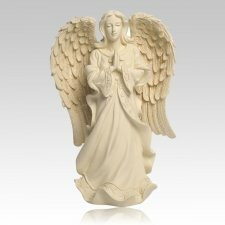 This elegant sage alabaster urn is hand-lathed in a process that a can take 25-40 hours from start to finish. This is an heirloom piece. 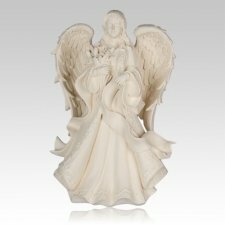 Our Italian Alabaster Family urn is beautifully lathed from natural stone. It is large enough to hold the remains of three to four people. 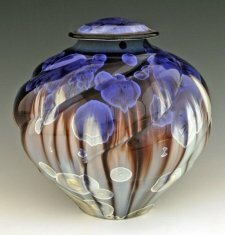 Glass is an elegant material to encase the remains of your loved ones. 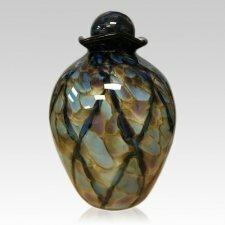 We offer some stunning companion glass urns as sampled below: Memory Glass: This companion chest urn is handcrafted with swirling earth tone colors and brass accents. 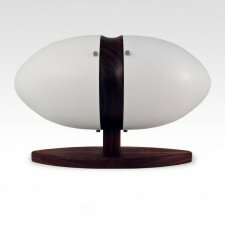 It is a stunning option for storing the remains of your loved ones. 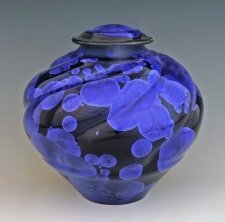 Swimming Together: This handblown vase urn in several shades of blue is perfect for combining the ashes of husband and wife as they swim together for eternity. 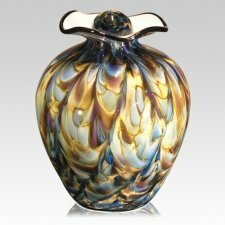 Zeus & Mermaid: This stunning vase-style urn for two is handblown one piece at a time. 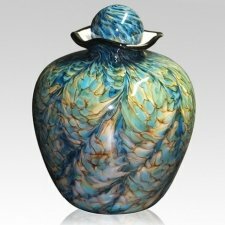 It features a vibrant display of sea colors with mermaid-like markings. 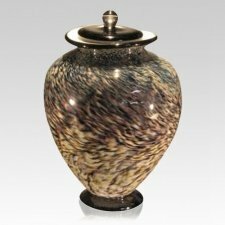 This companion chest urn is handcrafted with swirling earth tone colors and brass accents. 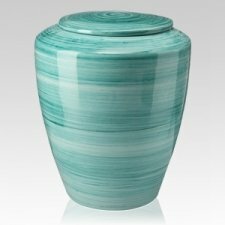 It is a stunning option for storing the remains of your loved ones. This handblown vase urn in several shades of blue is perfect for combining the ashes of husband and wife as they swim together for eternity. 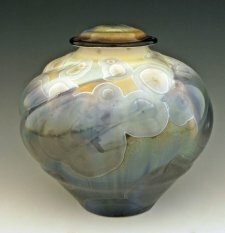 This stunning vase-style urn for two is handblown one piece at a time. 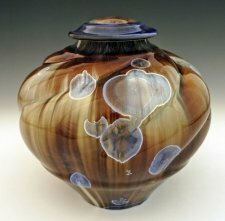 It features a vibrant display of sea colors with mermaid-like markings. 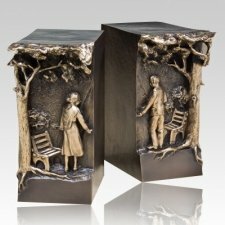 While the above list of companion urns for two adults or more doesn't account for all the materials and styles we offer at Memorials.com, it does highlight many beautiful options. 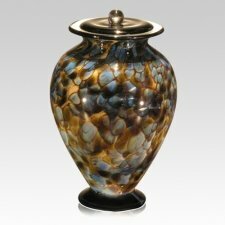 Whatever urn you choose for your beloved couple, the price you see is the price you pay. Ground shipping is always free, but you can upgrade to 2nd-day air or overnight for a small fee. 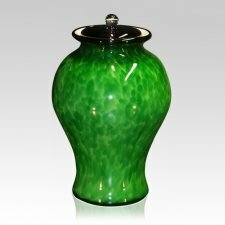 Want to learn more about our companion urns? Read our article about the subject.